An expanded version of this article was published as the science-fact article "Onward: to the Pole!" Analog , June 1999. A first Mars expedition will be greatly facilitated by use of in-situ Mars resources for producing return propellant. While most discussions of Mars resource availability assume that a Mars mission will target an equatorial or mid-latitude site, I argue here that there are significant advantages to choosing the polar regions for an initial landing site. Polar regions facilitate easy access to Mars volatiles in the form of frozen water and carbon dioxide. This is important not only for production of rocket fuel for the return to Earth, but for production of fuel for local mobility. A polar expedition would not have to bring hydrogen from Earth to produce propellant, but could extract hydrogen by simply melting available ice. Also, during the Mars summer, the Sun is constantly above the horizon. This allows continuous power generation without the requirement for heavy power storage systems, and allows direct communications to Earth. While a polar site may be less desirable for some geological studies, since the terrain is ice-covered, geological studies of non-ice-covered terrain can easily be accomplished by use of a long-range rover, and there are unique exploration possibilities to gather information available from polar science which is not found elsewhere on the planet. Proposals for a human expedition to Mars rarely consider a landing on one of the polar caps of Mars for the first expedition, and yet there are excellent arguments that the a polar landing site may well be, in fact, the best choice of location for a first mission to Mars. By "polar landing site," I specifically mean here a landing on the permanent polar ice sheet. In particular, I will argue that a human mission to the north polar cap during the polar summer would be far easier than a mission to any sites on Mars at lower latitudes. This discussion amplifies a suggestion made in an earlier paper  where I proposed a polar site for the first human landing to Mars. Polar sites have both operational and scientific advantages, which I will discuss. Constant sunlight (during polar summer). The power system can be a significant mission driver , especially for power-hungry missions such as missions where many metric tons of rocket fuel are produced from local resources . It is not clear that a nuclear power source will be politically feasible. Mars, like Earth, has seasons, and the polar regions, like the Earth's polar regions, receive 24-hour sunlight during the summer months (or 24 hours and 40 minutes, counting in Earth hours instead of Mars hours). A solar power source exposed to the 24-hours per day of polar sunshine would be an extremely lightweight, high reliability power source. The heavy, inefficient, and unreliable electrical storage system, either batteries or regenerative fuel cells, can be the major mass element of the power system; these are eliminated for a landing in the polar summer. Simplicity and performance of the power system. Not only does a polar landing site remove the requirement for storage, a solar array designed for the polar summer is far simpler than a solar array for other latitudes. The tracking system requires only a simple vertical pivot. In addition, the vertically oriented array will not accumulate dust, which can be a major degradation mechanism for solar arrays for long term operation on Mars. Finally, the power produced by the solar array is significantly increased by two factors: first, the efficiency of conversion of a photovoltaic array increases at low temperatures, and second, sunlight reflected at a low-angle of incidence on highly-reflective snow will increase the amount of sun reaching the solar panels by a factor of roughly 40%. Abundant resources. While much discussion has been made recently about the use of carbon dioxide as a resource for production of rocket fuel, it remains to be emphasized that in production of rocket fuel, the single most useful raw material would be water. Water is available at the north polar cap in the form of polar ice, and is available in vast quantities, in an easily accessible form which does not require drilling into buried permafrost layers or condensing a low mass-fraction component out of the atmosphere. Water ice can be melted and electrolyzed to make hydrogen and oxygen rocket fuel; the hydrogen can be used in Sabatier or RWGS reactors to form methane and higher hydrocarbons, or the hydrogen can be discarded if oxygen is desired. If in-situ resources are really the key to space exploration , why not land in the site where the best possible resources is known to be present? Constant temperature (during the polar summer). The temperature of the polar ice cap stabilizes during the summer at a point very close to the frost point of carbon dioxide, -125C. The constancy of temperature due to the absence of a diurnal cycle will make the design considerably more robust, since it is in general the thermal cycling, and not the low temperature in and of itself, that puts stress on parts. In general, heating is much easier to accomplish than cooling. Low temperatures. Low temperatures are desirable for liquefaction and storage of rocket propellant. Cryo-coolers are much more efficient in the lower temperatures. Less insulation will be necessary for cryogenic propellant storage, and some "soft" cryogenic propellants (such as hydrocarbons) are liquid at -125C with only mild pressurization. In addition, many electronic and life-support systems are projected to require massive thermal radiators to reject waste heat at low latitude sites, which will not be required for polar sites. Orbital station passes overhead every orbit. If a direct-to-Earth return is not contemplated, a return vehicle or a return habitat module may be stored in Mars orbit. There are more opportunities for a launch to rendezvous with an orbiting vehicle if the landing site is at the pole. With the exception of a landing site on the equator and an orbital station in equatorial orbit, an orbital station will only pass overhead twice a day for any non-polar location on Mars. Since communications to Earth will most likely be via a relay satellite, this is a significant factor. It will make the difference between near-real-time high data rate video and frequent contact with home, and twice-daily contact. High data rate is important to public interest and scientific participation via immersion "virtual reality" quality images and data. Local resources for long-duration traverses. The abundance of sunlight and the fact that polar ice is available for hydrogen means that in-situ resources can easily be processed for fuel for local mobility, including such vehicles such as wheeled rovers, airplanes, or rocket-powered "hoppers." In fact, if it is of interest to visit non-polar sites, the easiest means to do may be to land on the polar cap and then move to the non-polar region of interest than to make an initial landing at the non-polar site. Wide launch windows for direct-to-Earth launch. A direct to Earth launch window from a non-polar region occurs only twice a day, when the longitude of the landing site rotates to alignment with the boost direction. No place on Mars is uninteresting! Scientifically, it makes sense to go to the location on Mars which is easiest to get to; we can learn tremendous amounts about Mars from any location, since every location on Mars is new to us. Nevertheless, there are good arguments that, in fact, the polar regions on Mars are of particularly great scientific interest. A summary of reasons for exploration of the Martian poles is given by Cockell , although Cockell did not propose a polar landing site, but rather suggested exploration by suborbital traverse from a more temperate landing site. The polar regions of Mars are not well understood. 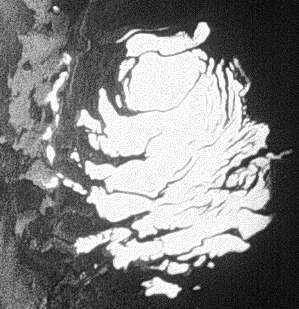 The maximum thickness of the ice cap is unknown, but is estimated to be between 4 and 6 kilometers. Likewise, the amount of volatiles stores in polar ices is a matter of some debate. One of the important reasons for studying Mars is to understand the question, How is the Martian climate different from Earth? On Earth, the best way to study the climate record on Earth is by looking at ice cores drilled from the pristine polar caps of Greenland and Antarctica. Hundreds of thousands of yearspossibly millions of yearsof climate of Mars is recorded in the ice caps; if we want to learn the climate history of Mars, we should go to the poles. Ice isotope ratios, atmosphere inclusions, and dust layering can be examined from core samples of the ice. A major reason to explore the Martian polar regions is to understand the Mars climate. There are significant things to be learned about the climate history of Mars. We know that Mars was once warmer and wetter than it is now; is the warmer climate episodic? How long has it been since the last period in which Mars had a climate where liquid water existed on the surface? How does the obliquity of the Mars axis affect climate; what are the long-term climate cycles, and how do they phase with variations in the eccentricity and axial tilt of Mars? What is the historical record of global dust storms, and how do they depend on the climate and the orbital parameters? Most importantly, what can we learn about the climate of the planet Earthpast, present, and future, from knowledge of the climate of Mars? The answers to these questions are encoded in the layers of the polar ice. The poles of Mars are encircled by a region known as the polar layered terrain (figure 2), which is unique to Mars. These regions cover an area of slightly under half a million square kilometers around the north pole, and over a million square kilometers around the south pole. What is the layered terrain, when was it laid down, and what information does it encode? Thomas et al. summarize the current knowledge of polar deposits and conclude: "the polar deposits remain mysterious after many years of close scrutiny," following this statement with a list of six major items that are unknown, ranging from composition of the layered deposits to the correlation of layer thickness with the expected climate cycles. If we are going to Mars to find landforms not present on the Earth, we will want to examine the polar terrain. An additional reason to choose a polar landing site is the search for life. A key part of the search for life is the examination of organic molecules. In general, organic molecules do not exist on the Mars surface; the Mars environment is too hostile for organics to be able to be preserved for long. There is one exception to this rulethe poles. In the polar regions, organic molecules could be preserved in a "deep freeze", protected by low sun angles, low temperatures, and deposition of protecting layers of ice from degradation. If we are going to Mars to search for the building blocks of life, the poles are the places to search. A disadvantage of a polar landing location comes from the fact that the mission is constrained to occur during the polar summer. This reduces the number of mission opportunities, since some missions arrive at Mars during the wrong season. The numbers of mission opportunities is increased if missions are accepted where the surface stay is less than a full half year. Since each successive mission opportunity occurs on the average 50 days later in the year than the previous opportunity , a given mission geometry will repeat every 15.8 years. One of the advantages of the polar base is continuous sunlight. This is only obtained if the surface operations are constrained to be only during the hemispheric spring and summer, and hence this puts a landing and a launch window on the surface stay. At the north pole, spring and summer run from heliocentric longitude Ls = 0 to 180 degrees, a total of 383 days, and for the south pole from Ls = 180 to 360 degrees, a total of 305 days (counting in Earth days). The duration is shorter in the southern hemisphere since perihelion occurs during southern summer. The 383-day north-polar stay-time is slightly under the 440-day stay time typical of a conjunction-class (minimum energy) mission. (Note that this stay time is not fixed at 440 days, but varies from opportunity to opportunity, due to the fact that the orbits of Earth and Mars are elliptical and not coplanar. It also depends on the trajectory type chosen.) Type II trajectories take longer than type I, and typically result in shorter stay times. In many cases, the penalty for arriving at Mars thirty days late in the launch window, and for launching for Earth thirty days early in the launch window, is relatively low . A strategy to deal with the requirement to land after the onset of sunlight is to arrive at Mars and wait in a parking orbit until the landing window opens at the beginning of the hemispheric spring, or to launch from Mars early, and wait in parking orbit until the Earth-injection return window opens. Since the mission transit time is typically eight to eleven months, the one to three months of orbiting required is not unreasonable. Table 1 shows the minimum-energy launch and arrival timelines for two typical northern-hemisphere summer mission opportunities. As can be seen, for the 2016 mission, the optimum date for arrival in Mars orbit occurs three months before sunlight reaches the north pole. Thus, the mission would be required to wait in Mars orbit for 106 days for the landing window to open, if continuous sunlight is required. Alternately, the mission could pay a slight penalty for late departure, and shorten the time in orbit required correspondingly. Since the departure for Earth occurs before the autumnal equinox, the mission does not have to wait in orbit on departure. For the 2018 mission, the optimum date for arrival at Mars occurs 75 days before sunlight reaches the pole. In this opportunity, however, the optimum trans-Earth injection occurs slightly after the end of the polar summer, and hence the mission must either depart for Earth before the optimum date, and pay the (relatively minor) penalty in delta-V required, or else must wait in orbit for the optimum return window. An alternative would be to land at a polar latitude somewhat less than 90 degrees. In this case, there will be some sunlight (although not continuous sunlight) before the beginning of spring, and hence a daylight landing could be done before the vernal equinox. This reduces the continuous-sunlight advantage of the polar site, but nevertheless during most of the mission stay the sunlight duration will be long. The major disadvantage of a polar landing location, as discussed above, comes from the fact that the mission is constrained to occur during the polar summer. This reduces the number of mission opportunities, and puts constraints on the mission stay duration which result in the mission either paying a penalty in required delta-V, or else waiting in orbit for a landing window. Geology. Planetary geologists, in general, are (with a few exceptions) not greatly interested in studying ice; geologists focus on rocks. Nevertheless, it may be easier operationally to land at a polar location and then travel to a desired non-polar region than to land in the non-polar region in the first place. High air mass. At the high sun angle found at the poles, the path length of the sunlight through the atmosphere is many times the thickness of the atmosphere. This means that the amount of dust in the path of a given ray is much higher at the polar regions than at subsolar latitudes. However, despite these factors, I believe that on the balance the advantages of a polar landing site to the power system outweigh the disadvantages. During some seasons the Martian poles are subject to a meteorological phenomenon known as the polar hood, which will also decrease the amount of sunlight a solar array will receive. Since the polar hood is primarily a fall and winter phenomenon , this is not a concern. Wind. Polar wind velocities have not been directly measured, however, during the polar spring, where large amounts of frozen carbon dioxide sublimate into the atmosphere, the wind velocities at the edges of the polar caps are believed to be very high. Evidence of high wind velocities is seen by the observation of small dust storms at the edges of the caps during the spring. The wind velocity at the center of the caps is unknown. Since the density of the Martian atmosphere is less than 1% of the density of the Earth's atmosphere, high wind speeds do not present nearly as much of a problem on Mars as they do on Earth. However, it will be desirable to more fully characterize polar winds before designing a polar mission to Mars. Equatorial velocity. The rotation of Mars contributes a delta-V of roughly 0.25 km/sec to a launch from a site on the equator. This is small enough compared to the delta-V required for transfer from the surface of Mars to a trans-Earth orbit that it is not a major issue. Orbital phasing. For a direct-to-Earth launch, the polar regions are actually better than non-polar regions. A direct to Earth launch window from the pole is always open, while the launch from a non-polar region occurs only twice a day. While most Mars missions assume that the first human landing on Mars should be in the temperate regions, this is by no means an obvious conclusion. A first Mars expedition would be considerably simpler if a polar landing site is chosen. This paper has benefited from the comments and suggestions made by members of the audience when it was presented at the presented at Founding Convention of the Mars Society. G.A. Landis, "Footsteps to Mars: an Incremental Approach to Mars Exploration," Journal of the British Interplanetary Society, Vol. 48, 367-342 (1995). Reprinted in From Imagination to Reality: Mars Exploration Studies Volume II, AAS Science and Technology Series Volume 91, 339-350, R. Zubrin, ed. (1997). B.I. McKissock, L.L. Kohout, and P. C. Schmitz , "A Solar Power System for an Early Mars Expedition," NASA TM 103219, presented at American Institute of Chemical Engineers Summer National Meeting, San Diego, CA, August 19-22, 1990. R. Zubrin and R. Wagner, The Case for Mars, Free Press 1996. C.S. Cockell, "The Polar Exploration of Mars," AAS 97-381, published in Journal of the British Interplanetary Society, Vol. 48, 355-364 (1995). Reprinted in From Imagination to Reality: Mars Exploration Studies Volume II, AAS Science and Technology Series Volume 92, 339-350, R. Zubrin, ed. (1997). P. Thomas et al., "Polar Deposits of Mars, Mars, U. Arizona Press Space Science Series 1992, pp. 767-795. C.P. McKay, "Life on Mars: Past, Present and Future," presented at Founding Convention of the Mars Society, August 13-16 1998, Boulder, CO.
R.W. Zurek et al., "Mars Atmospheric Dynamics," Mars, U. Arizona Press Space Science Series 1992, pp. 835-933. N.J. Barter (ed. ), Appendix 8, "Example: Manned Mars Mission Design," pp. 8-21 to 8-31, TRW Space Data, 4th Edition (1989). My first novel, Mars Crossing features a landing at the Martian pole.